Made with solid metal frame completed in a chic gold coated finish, this Simmer Stone Makeup Mirror is a beauty essential for your vanity. Designed with a 360 rotatable and adjustable mirror to accent your best features, easily adjust to any angle for precise application of makeup or other beauty products. The picture perfect reflection glass won't fog up, perfecly and clearly display your beauty and cosmetic features. The simple metal construction is easy to clean with a damp cloth. Vintage Makeup Mirror - Made with sturdy metal frame construction completed in a vintage and chic gold coated surface, help you finish your makeup effortlessly. 360 Degree Rotatable - Features a flexible adjustable design, easily adjust to any angle to help you perfect any makeup or cosmetic process from facial to hair or dress and jewelry matches. 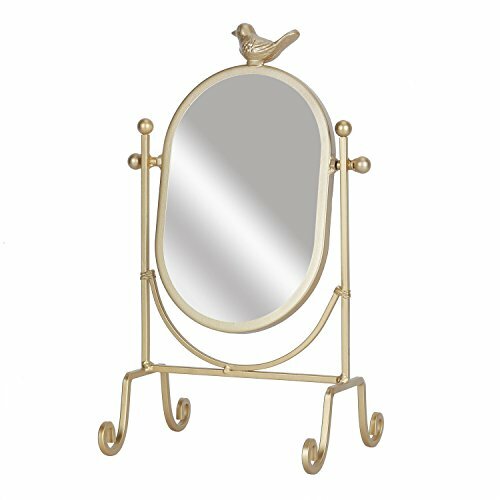 Elegant Metal Frame - Solid metal frame designed with graceful scrolled end and a lovely bird stands on the top, add an beautiful and fashionable style to your room instantly. Versatile Applications - The classic and elegant design with a lightweight body, easily to remove and place in any room, adds a touch of luxury to your bathroom or any other vanity area. Mirror measures in 6.3"W x 10"H, simply place on table top as a vanity mirror, provides a wide area for precise application of makeup or other beauty products. If you have any questions about this product by Simmer Stone, contact us by completing and submitting the form below. If you are looking for a specif part number, please include it with your message.